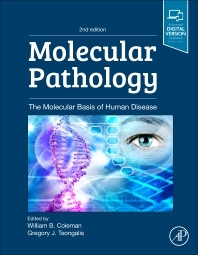 As the molecular basis of human disease becomes better characterized, and the implications for understanding the molecular basis of disease becomes realized through improved diagnostics and treatment, Molecular Pathology, Second Edition stands out as the most comprehensive textbook where molecular mechanisms represent the focus. It is uniquely concerned with the molecular basis of major human diseases and disease processes, presented in the context of traditional pathology, with implications for translational molecular medicine. The Second Edition of Molecular Pathology has been thoroughly updated to reflect seven years of exponential changes in the fields of genetics, molecular, and cell biology which molecular pathology translates in the practice of molecular medicine. The textbook is intended to serve as a multi-use textbook that would be appropriate as a classroom teaching tool for biomedical graduate students, medical students, allied health students, and others (such as advanced undergraduates). Further, this textbook will be valuable for pathology residents and other postdoctoral fellows that desire to advance their understanding of molecular mechanisms of disease beyond what they learned in medical/graduate school. In addition, this textbook is useful as a reference book for practicing basic scientists and physician scientists that perform disease-related basic science and translational research, who require a ready information resource on the molecular basis of various human diseases and disease states. Greg Tsongalis is the Director of the Laboratory for Clinical Genomics and Advanced Technology (CGAT) at the Dartmouth-Hitchcock Medical Center and Norris Cotton Cancer Center (NCCC) in Lebanon, NH and a Professor of Pathology and Laboratory Medicine at the Audrey and Theodor Geisel School of Medicine at Dartmouth in Hanover, NH. He is a member of the NCCC Molecular Therapeutics Program and the gastrointestinal and breast cancer clinical oncology groups. In 2016 he became a member of Dartmouth College’s Program in Experimental and Molecular Medicine (PEMM), and he has served on the advisory board of the Health Care Genetics Professional Science Master’s Degree Program at the University of Connecticut (Storrs, CT). His area of expertise is in the development and implementation of clinical molecular diagnostic technologies. His research interests are in the pathogenesis of human cancers, personalized medicine and disruptive technologies. He has authored/edited twelve textbooks in the field of molecular pathology, published more than 200 peer reviewed manuscripts, and has been an invited speaker at both national and international meetings. He has served on numerous committees of the AACC, ASIP, FASEB and AMP where he is a past President. He is active in the Alliance for Clinical Trials in Oncology, the Association for Molecular Pathology, the American Association for Clinical Chemistry, the American Association of Bioanalyts, and the American Society for Investigative Pathology. He serves on the editorial boards of 8 journals including Clinical Chemistry, Experimental and Molecular Pathology, and the Journal of Molecular Diagnostics. He also serves on numerous corporate scientific advisory boards.